22 December 2013 was introduced the European Council Regulation establishing Erasmus +: the EU program for young people's education, training, and sport for 2014-2020. The program started in the academic year 2014/2015 and will last until 2020. Not only students can benefit from the new program but also other participants of the educational system: students (including adult learners) and teachers of general education and vocational training (trainers, youth workers and volunteers), as well as educational institutions, NGOs, and youth and sports organizations. 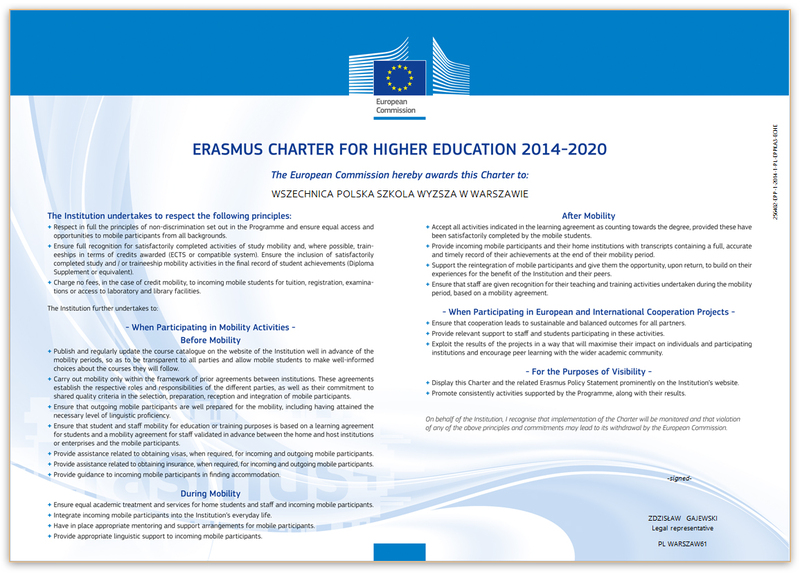 The strategy of WSZECHNICA POLSKA UNIVERSITY in WARSAW includes achievement of the notions promoted by the Erasmus Programme in the area of supporting cooperation between the European Union states and other countries, supporting educational exchange, intercultural relations, and at the same time ensuring that our students and staff obtain valuable academic and professional experience in an international environment. Cooperation under the Erasmus Programme is strictly connected with the University's mission included in the strategy of development, namely providing best education to student s responding to the needs of the domestic, European, and regional job market, training enlightened citizens of democratic states who actively promote their own lifelong development. As part of international cooperation, Wszechnica Polska is searching for such regions and universities and also such type of people which guarantee improvement of the quality of education, achievement of challenges related to the Bologna Process and may have impact on successful implementation of the solutions constituting the essence of the National Framework of Qualifications. In its recruitment policy, the University applies the rule of "non-discrimination and equal opportunities for all", and also support of students and staff interested in the Erasmus Programme who belong to insufficiently represented groups, are disabled Ol' in difficult financial situation. In addition to prior cooperation with European universities, Wszechnica Polska will intensify its actions aimed at searching for new partners in international exchange and cooperation, in particular with new EU member states, such Romania, Bulgaria, Czech Republic, Slovakia, Hungary, Slovenia, and Croatia, and other countries such as Russia or Ukraine. This should increase participation of students in internships abroad under the Erasmus Programme and strengthen actions aimed at tightening relations with foreign companies where students may serve their internship, and also actions aimed at promoting participation in international projects and thematic network s among academic staff, launching new study programmes in English based on cooperation with universities abroad, using e-learning, preparation and implementation of curricula to obtain authorisation to issue joint diplomas. Participation of all Faculties of the University in the Erasmus Programme constitutes one of the main strategie objectives of development. We strive for such level of cooperation so our academic and research staff, administration personnel, and students may use experience gained during the Erasmus exchange in Wszechnica Polska. We chose international cooperation partners which may enrich new educational experience, both from the Western and Eastern Europe. We analyse to what extent study programmes of a partner University are similar to our programmes and how they may complete our programmes. International cooperation of Wszechnica Polska covers organisation of and conducting joint research projects, scientific conferences and semmars, preparation of joint publications, exchange of scientific information, joint preparation of didactic programmes, exchange of research and academic staff and students, preparation and joint use of distance learning methods. Currently, out University cooperates with the Moscow Academy of Economics and Law, Sergei Witte University of Moscow, Kokshe Academy in Kazakhstan, Academy of Fire Safety in Cherkasy, Ukraine, Matej Bel University in Banská Bystrica, Slovakia, the Pushkin State Russian Language lnstitute in Moscow. Under the Erasmus Programme, we develop cooperation with the Universitat de Barcelona, Universitat Autónoma de Barcelona, Institut Limayrac Toulouse, Universidad Camilo José Cela, University of Latvia in Riga, Mykolas Romeris University in Vilnius, Instituto Politécnico de Portalegre, Instituto Politécnico de Santarém, Doğuş University in Istambul, Afyon Kocatepe University in Afyon, Turkey. The list of partner universities is still open. In the past, Wszechnica Polska initiated many forms of cooperation, but also constructively reacted to all proposais received. This aspect will be similar in the future.